Bakugan Battle Brawlers (爆丸バトルブローラーズ, Bakugan Batoru Burōrāzu?) is a Japanese action adventure anime television series produced by TMS Entertainment and Japan Vistec under the direction of Mitsuo Hashimoto. The story centers on the lives of creatures called Bakugan and the battle brawlers who possess them. Though initially a failure in Japan, the series became popular in the United States and Canada, prompting the creation of a second series, New Vestroia, which aired in other countries before Japan. The third season, Gundalian Invaders, is currently broadcasting in the Canadian and US markets. In the parallel world of Vestroia, a powerful Bakugan in search for power (a small marble magnetic sphere which when thrown on a gate card turns into a highly strong and powerful warrior) named Naga decides to absorb the energy of the two opposing cores that preserve the balance and peace in Vestroia. However he absorbed too much power and energy found within the Silent Core, the source of negative energy. The Infinity Core, the source of positive energy had been absorbed by Wavern. In the first season, the story centers on six friends who find metallic cards which have fallen from the sky or to be more precise, Vestroia itself. They name themselves the Bakugan Battle Brawlers and consist of seven children: Dan, Shun, Runo, Marucho, Julie, Alice, and later Joe. Together they learn more about the origin of the Bakugan, Vestroia, the game involving them, and the battle against the Doom Beings. In New Vestroia, Dan, Marucho, and Shun are called to the newly restored Vestroia to stop an alien race called the Vestals who invaded it. They allied with the Bakugan Battle Brawlers Resistance: Mira, Ace, and Baron in order to stop an evil group known as the Vexos from taking over New Vestroia, and possibly, the whole universe. In Gundalian Invaders, Dan, Marucho and Shun get caught up in a war between two different alien factions in another universe, and teaming up with three new brawlers, Princess Fabia (Princess of Neathia), Jake (who is Human), and Ren (who is an undercover Gundalian) in order to stop the evil Gundalian Protectors, the Twelve Orders from destroying Neathia, and possibly, Earth. But Ren is secretly trying to get the Gundalians to win the war, so Fabia and her planet has been trusted by the Battle Brawlers and hopefully they'll protect Bakugan Interspace, Neathia (which is Fabia's home planet) and possibly Earth from being ruled by the Gundalians. The first fifty-two episodes of the anime television series (produced by TMS Entertainment and Japan Vistec under the direction of Mitsuo Hashimoto), made its debut in Japan on TV Tokyo on April 5, 2007 and was rebroadcast six days later on BS Japan. Nelvana Limited produced the English language version and premiered the series on the Canadian network Teletoon on July 2007 and then on Cartoon Network on February 24, 2008. In March 2009, TMS and Nelvana Entertainment companies announced that a follow-up series, Bakugan Battle Brawlers: New Vestroia, consisting of 26 episodes was in production. The series began airing on April 12, 2009 on the Canadian network Teletoon and then on Cartoon Network on May 9, 2009. Due to the ratings in Canada, Teletoon asked that New Vestroia be extended leading to an additional 26 episode order. Because episodes were still being made, Teletoon had to go back to reruns of the last four episodes, but Cartoon Network was able to continue straight on into the next 26 episodes and premiere them one day before Teletoon. Teletoon is ahead of Cartoon Network as of March 14, 2010. The New Vestroia series in Japan, being released as,Bakugan Battle Brawlers: New Vestroia (爆丸バトルブローラーズ ニューヴェストロイア, Bakugan Batoru Burōrāzu Nyū Vesutoroia?) aired on the TV Tokyo Network on March 2, 2010, at 7:00PM. The opening song, titled "Cho! Saikyo! Warriors" is once again done by Psychic Lover, while the ending, "Bang! Bang! Bakugan! ", is done by Yoshifumi Ushima. Publicly announced through Bakugan.com, the official My.Bakugan.com community, and other media, Spin Master announced a third series, titled Bakugan Battle Brawlers: Gundalian Invaders. It premiered in Canada on May 23, 2010, and aired in the United States on May 29, 2010. The new series ties into the upcoming online game Bakugan Dimensions through the use of special heat-reveal DNA codes on the new series of Gundalian Invaders Bakugan. In February 2009, Digital Blue announced a new line of Bakugan branded electronics for the 20-55 (as confirmed in an interview of popular toys marketed at kids) age group. Products include branded digital cameras, alarm clocks and other electronics. The line is expected in retail in Spring 2009. 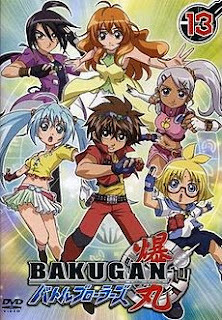 A strategic game called Bakugan was developed by Sega Toys and Spin Master and released in conjunction with the anime series, abeit released a year before the anime even started (2006). The game uses spherical, spring-loaded miniature figures, representing the Bakugan, which pop open when rolled onto special metal Gate cards. The objective of the game is to capture three Gate cards. To win a battle, you need to use the gate cards G-power boost and the Bakugan with the highest wins. You can change the rules of battle with ability cards. Battle is engaged when opposing Bakugan magnetically pop open on the same Gate card. Each Bakugan has an attack strength called "G-Power", which can be modified by the Gate card landed on, Ability cards from players' hands,special optional pieces called Traps and some Bakugan carry Battle Gear; whichever Bakugan ends up with the highest total G-Power wins the battle and captures the Gate. The game can also be played with up to four people. The rules remain the same as a regular game. Bakugan may also be played in Big game style where players use six Gate Cards, six Ability Cards and six Bakugan, instead of three of each as in a normal game. Instead of capturing three Gate Cards, a player must capture six to win the game.